Happy Friday! 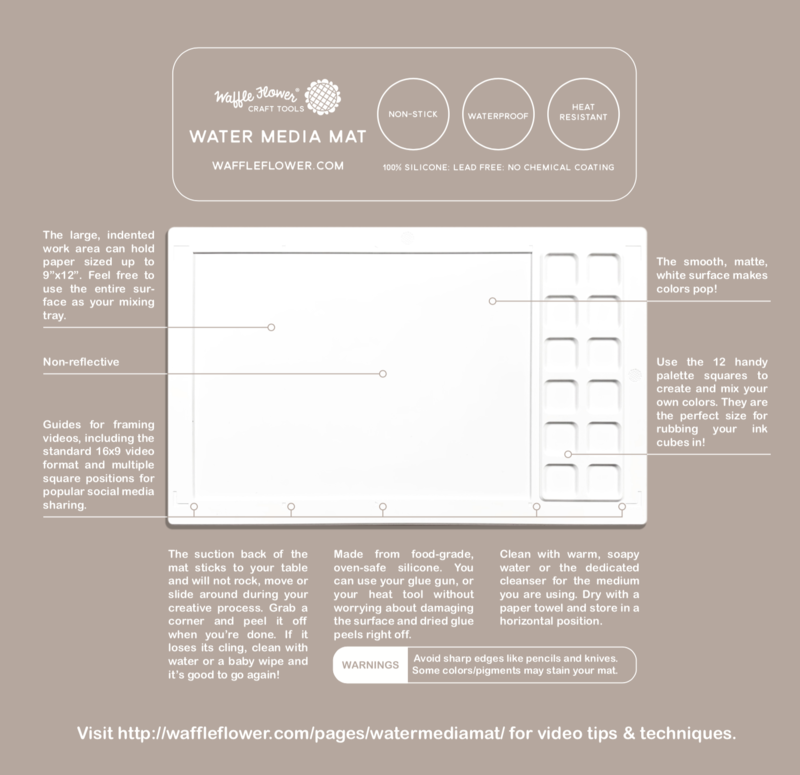 Waffle Flower has released a new water media mat a few days ago. 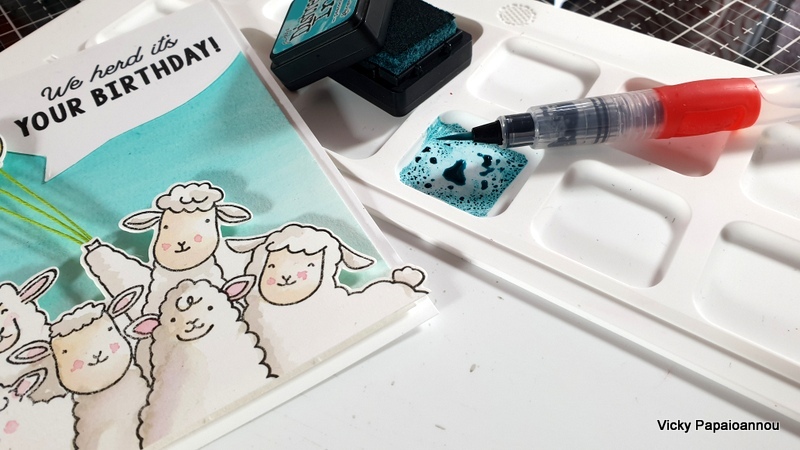 It’s the perfect mat for water coloring and today I join an awesome video hop where we all feature the new mat! Hop along with us to find out all about this new product, to see it in action, to get inspired and of course for a chance to win prizes. If you want to start the video hop from the beginning please visit the Waffle Flower blog HERE. 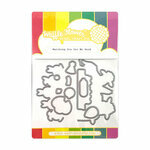 It’s a silicon mat made especially for your water coloring needs, really easy to clean and with a handy palette. The fact that it is white lets you see the true colors on your palette and it’s really easy to take it with you on the go. There are many advantages in using this mat and I discuss about all the features on the video below where I do a review of the mat. I also put it to the test with different mediums so you can see how to use and clean it. While reviewing the new mat I just had to make a card. For water coloring I used my good old distress inks in various colors. The stamp I used is a new Waffle Flower – We Herd( SBC | SSS | ELH ) , which you can get as a bundle including the stamps and dies or separately. Waffle Flower will pick 3 winners from comments left on all of our videos to receive a mat. So go to YouTube, like the videos on the hop and leave a comment there by 4/15 at each stop along your way. The winners will be announced by Waffle Flower. For the complete video hop list please visit the Waffle Flower blog HERE. Great new product but Waffle Flower! Thanks for sharing! What a great idea. Can’t wait to use the Waffle Flower media mat. 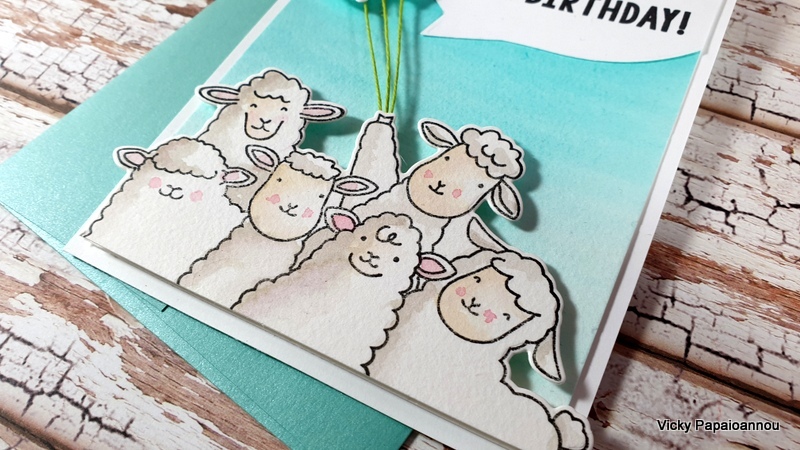 This is the cutest card ever and yup, the mat is a MUST have for sure! Enjoy your weekend! Very exciting work surface. It’s going on my wish list. WoW! Love it! What a great idea to help us to make coloring and mixing! Not got into watercolouring really but I’d like to give it a try. This new mat would certainly help!!! I just registered for a watercolor class and have been looking at supplies. This mat looks really interesting. I see in some of the demos on the video hop that it can be used for other purposes, too. That’s great! Thanks for letting us know about this. Adorable card! I like the portability of the mat. Thanks, Vicky, and have a great weekend. The Mat is “baaaaaaaasome” said this new herd member!! Really looks like an interesting addition. LOVE your card! The sheep are so cute! Love the We Herd set! I’m really excited about the Water Media Mat…. it looks fabulous! WOW!! this is a wonderful product. Im a gadget girl and always looking for new innovative products that make my life easier when Im crafting, etc. To me its always about the prep work that gets me to my end product…when the beginning process is stress free and the final stage of cleaning up afterwards always gets me happy so I can create more and spend less time from start to finish. I sure would love to win one of these. I think this is the next big thing in the crafting world! Love how thoughtfully it is designed. And I really loved the cute inspiration card. This is so awesome. Loving the media mat and your overview answered all of my questions. Thank you. I love this new mat, so useful and versatile and to be able to easily take with you for travel?!!! Wow! Great and cute card too Vicky! Hats off to Waffleflower! 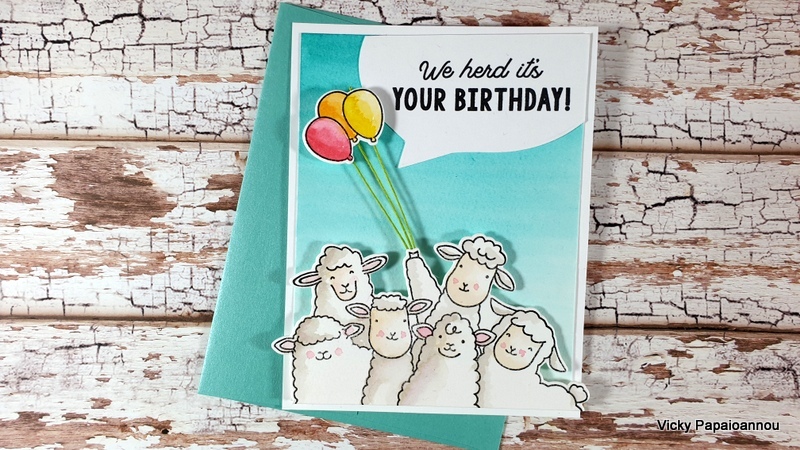 Thanks for doing the video and sharing your cute card! I really love this media mat! Perfect and just what I’ve been waiting for! I couldn’t understand working on a black background and love my silicone craft sheet. This is the next step up and I can’t wait to get one! Yes, this would be perfect to have, what a great idea to have it in white . On my wish list for sure. Nice card. I enjoyed to fun birthday card. Thanks for sharing your process video. The Media Mat looks a great addition to the craft room. Thank you for sharing your tips on cleaning this mat. I would really love one. Your card was adorable. I love that stamp set. Waffle Flower has come out with so many fun things lately!! What a fabulous card! This mat looks great. Great Video Vicki. The mat looks great to use and you explained everything so well. 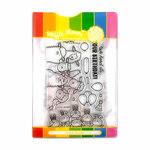 The stamps and dyes are cute and your card is too. Thank you. Absolutely love the watercolor mat and your card! Honestly, I wish I could think of card and art ideas like you do, Vicki! Great video and wonderful tips! Thank you!! I think this mat looks fantastic. Would love to win one. Thanks for the chance. This mat made me super excited to watercolor everything! Your presentation was very inspiring, especially that last alcohol hint to clean. Great review, I may have to give this mat a try. I love to watercolor and this would be so convenient to have. Thanks! Thanks for the great review of the Water Media Mat…but my favorite part is your adorable card. My water coloring skills are really lacking so I love watching others work their magic. What a great product! Easy to use, clean, portable and doesn’t take a lot of room to store. Thanks for the demo and very cute card Vicky. Your review and testing of the new mat from Waffleflower was fabulous! Thank you for sharing your findings with us! So sweet and so cool. What a great new idea. Love the water mat. I want one, if I don’t win where could I buy it?? That mat is great! I love to watercolor and the ability to use different mediums on one palette is a real time saver! great idea! That mat looks amazing, thanks for showing us. And that’s a lovely fun card you made, too . I loved it when I saw mirror stamping on IG! So I want/need it and also for watercolouring. Your talent never ceases to amaze me. It’s no wonder how so many companies love you. We love watching you also. You’re terrififc. 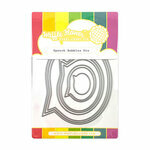 What a great review of the new mat, as well as a cute card! Thanks so much for your thorough review on this wonderful new mat! It looks like it would be an awesome addition to a crafter’s tools. Squeal!! This is such a cute card and I loved watching it all come together. Thanks for showing us different ways to use this new media mat.